Hypnotherapy has been called by some the second oldest profession known to mankind. However, there are many who refer to hypnotherapy as the fastest growing healthcare profession in America today. Hypnotherapy may well be both. Eastern philosophy has always taught us that we heal physically and emotionally from within. Western medicine had begun to share that philosophy. 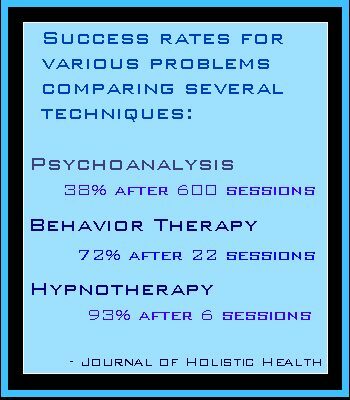 Hypnosis can be very beneficial in many cases as a therapy in itself. It is a valuable adjunct in psychotherapy and psychiatry. Yet few therapeutic procedures are less understood or more plagued by misconception. Hypnosis can better be described than defined. It is often considered an altered state of consciousness featuring selective perception, a process in which the subject chooses to see only what is relevant to their task. Hypnosis involves guided concentration. The guidance, however, may be provided by a qualified hypnotist or, in the case of self-hypnosis by the individual subject who is taught by a properly certified hypnotherapist. The subconscious mind receives and retains, neither accepting nor rejecting, all the messages we receive from our backgrounds, whether genetic, social, religious or experiential, plus all the conflicts (large or small) that enter our daily lives. When, for whatever reason, the conscious mind (which deals with everyday living, logic, reason, etc.) becomes overloaded, the subconscious prepares us for what is considered appropriate action (usually fight or flight). However, the subconscious mind does not analyze, as does the conscious mind, but accepts all messages in literal sense. In essence, hypnotherapy as a means of communication between the conscious mind and the subconscious mind. Many human problems, habits, stresses, anxieties, attitudes or apparent deficiencies can be traced to interpretations by the subconscious mind which, when these erroneous interpretations are understood by the conscious mind, specific problems can be reduced or resolved. Most hypnotherapists, on interviewing a new client, will ask the client what he or she thinks hypnosis is. Replies range from sleep, to unconsciousness, to surrender of mental powers and control, to magic and voodoo. All are in error. Hypnosis is not sleep. In most cases the subject is fully aware of communication and is able to respond on request either verbally or by signal. Unconsciousness is not involved in hypnosis. A subject asked to make a specific movement will comply with the request unless they find it objectionable. There is no surrender of mind control. A person who does not want to be hypnotized cannot be hypnotized or be induced to do or say anything. There is no absolutely no magic or voodoo involved in hypnosis. Any hypnotist can explain the actions and behaviors of their client. This is only a partial list. There are many other physical and emotional problems that can be helped through the use of hypnosis.